Recently installed, this garden will take a year or two to fill out and come into its own. Every request to I get to design a garden fills me with excited anticipation. I rejoice at an opportunity to create a destination that did not previously exist. In this sense, it is similar to creating rooms. Interior, exterior…it’s the same to me. I’ve only recently come to discover that it’s the same as painting and this realization has clarified my thoughts about my own particular creativity and the ephemeral and difficult to describe thing that I aspire to. It’s an opportunity to create a kind of beauty that evokes an emotional response. I have difficulty defining this. Impressive, grand gardens are not foreign to me. I like them, too. But, it’s the intimate, contemplative, richly varied yet harmonious, inspired, cohesive and yes, exuberant , and, dare I say, ‘traditional’ garden that I want to see. In art history terms (painting, that is), the gardens I try to create would evoke names like Chardin, Vermeer, Monet, a gentle sort of moody, static, elegant repose; floriferous and uplifting. 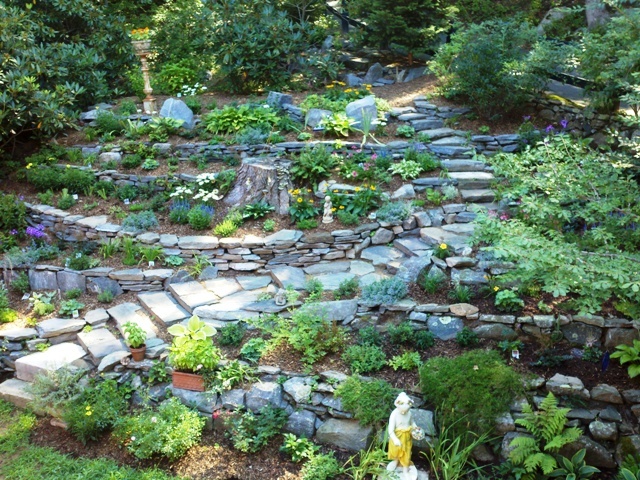 I have a landscape designer friend who is a great advocate for conceptual, avante garde gardens. She attends all the important English and French shows and keeps up on internationally known, cutting-edge landscape architects and garden designers who are creating ‘salt’ gardens, or vertical urban orchards, or gardens made of lights, teepees, metal cutouts woven into chain link fences. She thrusts herself, with the unceasing energy of a hummingbird, Slam! Bang! into the middle of it and I admire her for it. I LOVE her blog and feel honored to be able to keep up with the garden design trends through it. I am not, however, a conceptual artist. I get it but unless the elements of natural beauty are there to enhance and enliven the idea, I quickly lose interest. I don’t want to create clever, self-conscious, intellectually driven spaces. I want the magic of Bach or Vermeer or Yeats. No rare plants for the sake of it, no clever ‘tongue-in-cheek’ juxtapositions, few poetic combinations that will only be memorable through a macro lens, no showmanship or valedictorianizing. In the spaces where I want to tread or sit or ponder, I yearn for (and aim for) cohesion, vivacity, color, abundance, respite, …..that’s what I like. Andrew and I recently designed and installed the new garden pictured above for a client, whose remark upon seeing it was “this is a magical place”., and that’s exactly what we were aiming for. I think it only right to point out that the stone work was already in situ and is not the work of English Gardens and Landscaping.